Authentic SF 49ers Jerry Rice WILSON Football SIGNED. THIS IS ONE RARE ITEM... This football was from 1994 and made by WILSON! This is the commerative edition of Jerry Rice Record Setting 127 Touchdowns game against the Raiders!!! THIS FOOTBALL HAS 2 SIGNATURES yes 2 signatures!!! OF JERRY'S AT DIFFERENT PANELS OF THE FOOTBALL... ONE WITH ADDITIONAL INSCRIPTION OF #80 S. This football was signed by Jerry Rice himself!!! This is a must have for the 49ers or Rice fan! Jerry Rice is one of the best players to ever play in the NFL. Why not get a jersey with an All-Time Player on it? This football is NOT made in China!! Somethings to consider in regards to purchasing "real" jerseys. Especially if they have like 10 of those all with the same pictures!!! I just doesn't make sense! Authentic jerseys do not look like cheap t-shirts! Make sure sellers have the entire jersey laid flat with front and back. Step back and LOOK at the jersey! Does it have a good shape to it? My definition of an "AUTHENTIC" jersey is that the actually jersey itself is "REAL". Let's just go with the recent Reebok's. Find out if the actually jersey was made in El Salvador or Korea. The very recent Reebok's actually have some made in Vietnam. Just make sure the jersey is not made in CHINA, although some newer Mitchell & Ness are made there! I REALLY DON'T CARE HOW EACH PARTICULAR FAN LIKES TO PUT THE NAMES AND NUMBERS ON THE JERSEYS. Some fan like using different fonts and NOT even sewn on tackle twill. It's their jersey and they should do whatever they want to do with them. So just because a jersey doesn't have tackle twill sewn on numbers doesn't mean it is not authentic! Once again I always consider the actual jersey (without the name and numbers) whether it's real of not. Anyway, these days if you have NFL shop customize a jersey the work is so disgusting anway! Anyone who has received a less than acceptable quality custom job from NFL shop knows what I'm talking about. Authentic jerseys are NOT long like most of these fakes like same of Reebok Favre's and Puma Sanders! Those are just 2 examples. Reebok and Puma did not make their retail authentic jerseys long! Of course most older jerseys were cut longer, like the REAL Champion jersey and some Wilson. People, if the tags are all over the place... Some jocktags are way up on the jersey and not at the bottom!!! If you can't tell whether a jersey is real or not. Usually if someone sells a fake jersey, everything else he/she sells will be fake as well. The only authentic throwback reproductions are from Mitchell & Ness. THERE ARE NO SUCH THINGS AS PLAYER OF THE CENTURY! The same rules apply in regards to shape of the jerseys, the material of names and numbers. Also Mitchell & Ness does not reproduce recent jerseys!!! If you see "recent Reebok's" with M&N tag, stay away!!! If anyone needs help trying to figure a particular jersey don't hesitate to ask me. THESE JERSEYS ARE FROM MY PERSONAL COLLECTION. THEY WERE TAKEN OUT OF STORAGE BOXES, THUS SOME WRINKLES. I TAKE FULL PICTURES OF FRONT AND BACK. I DO NOT HIDE ANYTHING. WHAT YOU SEE IS WHAT YOU GET. I TAKE THIS JERSEY THING SERIOUS. I WISH EVERYONE CAN EXPERIENCE LEGIT JERSEYS. PLEASE DON'T HESITATE WITH ANY QUESTIONS. 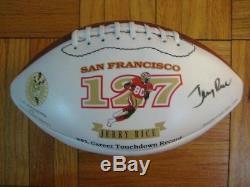 The item "94 Authentic SF 49ers Jerry Rice WILSON Football SIGNED" is in sale since Wednesday, December 09, 2009. This item is in the category "Sports Mem, Cards & Fan Shop\Fan Apparel & Souvenirs\Football-NFL". The seller is "jdpesn" and is located in Bronx, New York.